This is a copy of a map of the Coffeyville refinery, made in 1908 by the Sandborn Fire Insurance Company. Courtesy Kansas State University Libraries. 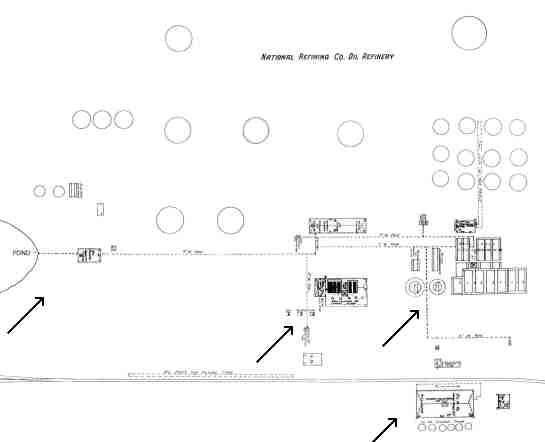 Click on one of the four arrows above to get a view of that portion of the refinery. Agitators 1908. This is located at the far right center of the 1906 post card. The two towers on the left in this photo are to the right in the post card. Courtesy Carl and Ralph Rauch. Steam and crude stills 1908. This is located at the center of the 1906 post card. This is almost directly below the word Coffeyville in the post card title at the top. This photo was also taken from the opposite direction. Courtesy Carl and Ralph Rauch. 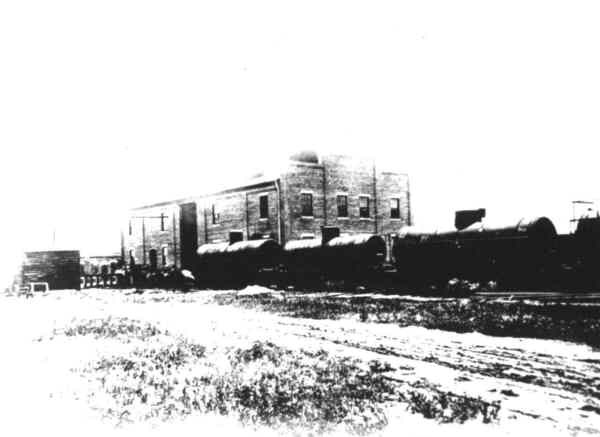 Barrel house 1908. This can not be seen in the post card. It would be in the center behind all the buildings you see in the post card. Courtesy Carl and Ralph Rauch. 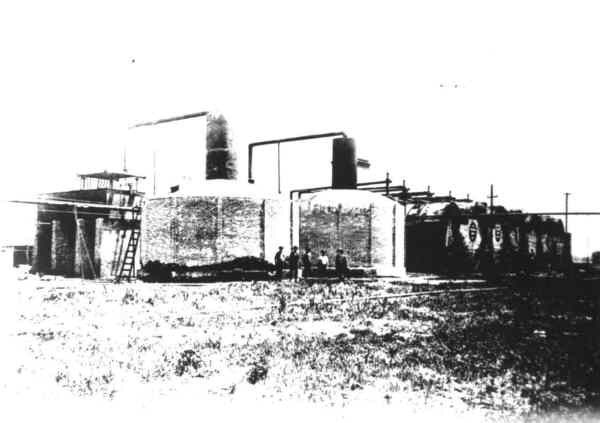 Boiler house 1908. 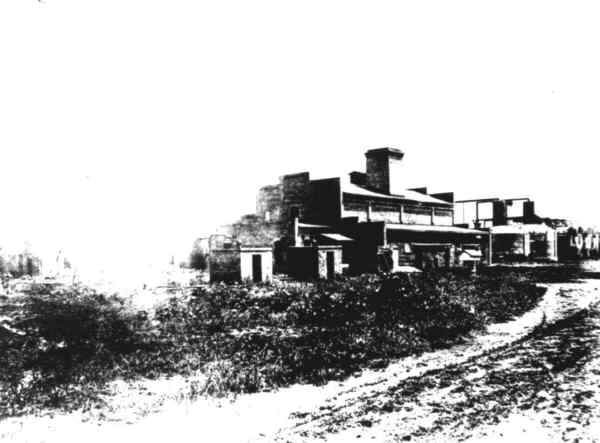 This is located in the group of buildings in the center of the 1906 post card. Also taken from the opposite direction. Courtesy Carl and Ralph Rauch. Barrel house 1935. Display of cans. National Refining did not start to use refinery sealed cans until 1934. Courtesy Carl and Ralph Rauch. Barrel house 1935. 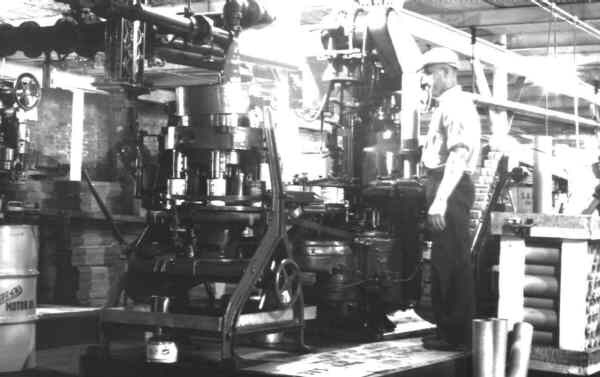 Operator at quart canning machine. 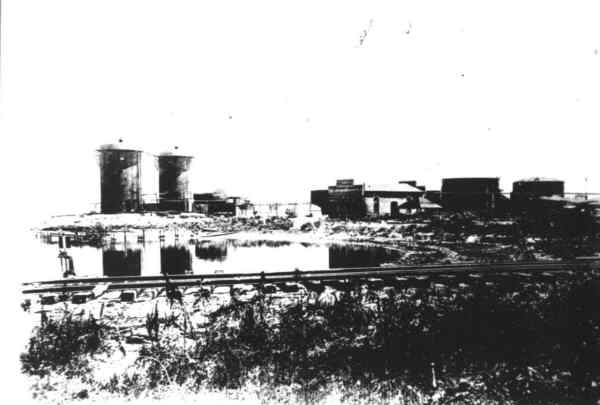 National Refining did not start to use refinery sealed cans until 1934. Courtesy Carl and Ralph Rauch. 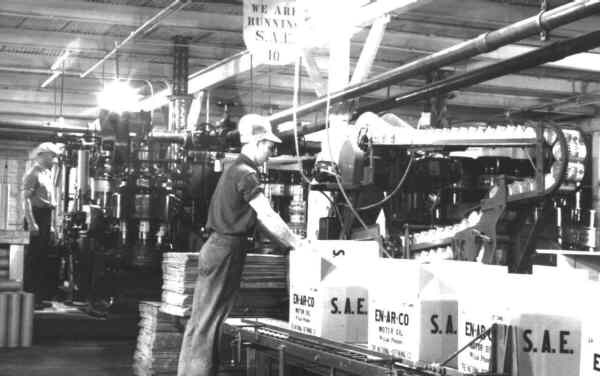 Barrel house 1935. 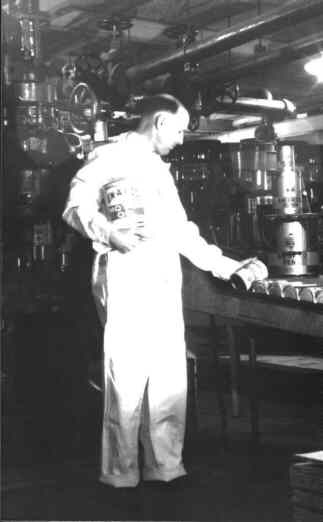 Canning machine operator and boxer.National Refining did not start to use refinery sealed cans until 1934. Courtesy Carl and Ralph Rauch. Over 50 images of the Coffeyville, Kansas refinery. © Copyright 1996 - 2006 Ben Eckart. All rights reserved.